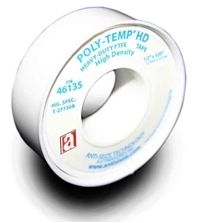 Our most-popular thread seal tape, Poly-Temp® HD is made from 100% pure PTFE resins. Its medium density allows it to be used as a general-purpose thread seal tape in most applications. May be used on all types of pipes and most services. More economical than most paste thread-sealing compounds, never dries out, no mess, no dripping, easy to apply, material, plus thicker and higher in specific gravity (high density). UL Recognized Component. Poly-Temp® Thread Seal Tapes are 100% PTFE from the highest quality resins available. This universal thread sealant can be used on all types of metal or plastic pipe connections and effectively seal a vast array of chemicals. POLY-TEMP® is a registered trademark of Anti-Seize Technology.